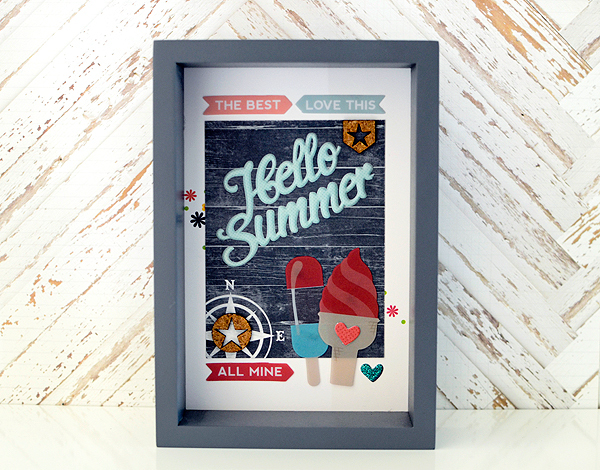 Well, here we are in September already which means I get to FINALLY show you the projects I made using the Gossamer Blue kits. I ended up making a bunch of things--many more than I intended to but you know how it happens: one thing leads to an idea for another thing and so on and so on and I got a little carried away. I come from a picturesque little village on Keuka Lake in upstate New York. Although we didn't own a house on the lake, the home I grew up in sat atop a hill overlooking it. My mother grew up in a neat red house on the lake and she loved anything beach-related. She was also one who decorated for every season. 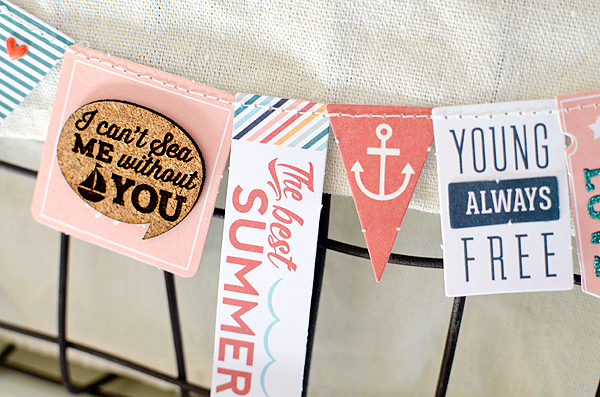 Each summer she turned our home into a red-white-and-blue beach house (minus the beach). While I'm not one to go for the nautical decor theme, I was inspired by the Life Pages Themed Add-On to pay tribute to my mother and her love of the water. The centerpiece was the wire basket of frames. I came up with the idea for the garland first and then needed something to put it on. The basket was somewhere near my desk, a designated catchall for anything that landed near it. I gathered my frames and then realized that I have a bunch of memorabilia from my hometown--much of it sent to me by my mom--and the idea grew from a basket to put summer photos in to an entire shelf of beach wares. 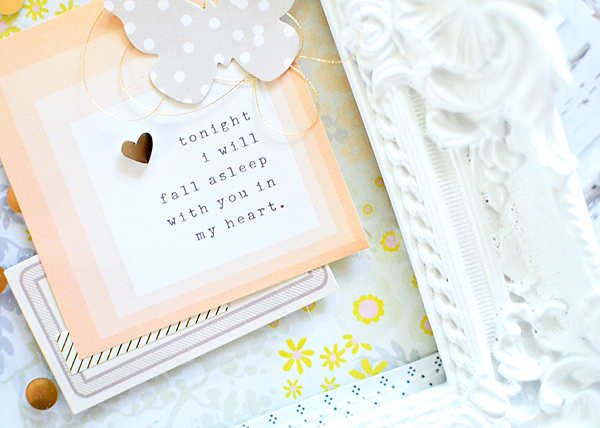 Traci Reed designed some of the CUTEST pieces for this kit, including the journaling cards and cork pieces. 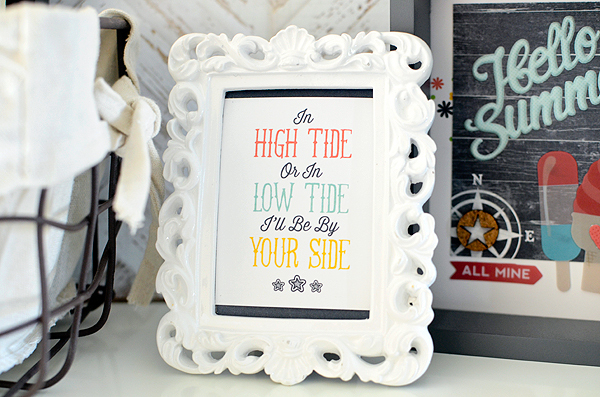 I adore the fonts she used for the "high tide..." card and had to feature it prominently on my shelf! Most of the other pieces from the kit are from Pink Paislee's Solstice collection. So while I typically don't go all out decorating for every season, I think my mom would be proud. But does this mean I'm turning into her?! I wish I had a better photograph of this white frame because I love the way it turned out! This is all the Main Kit except for the gold dot tag which is from the LP themed kit. Since I love Crate Paper's Notes & Things line so much, I was very excited to get a bit more of it in the GB kits this month. I made this for Nemy but I will confess I haven't put it in her room yet because I'm not done admiring it. I love it for it's sweetness and it reminds me of her so I'm keeping it in my studio for now. I have more projects to share, but this weekend will be a long-overdue Festive Friday post so I will have the GB stuff early next week. In the meantime, they are all up in the GB Gallery, so you can see them there. I've also recently been trying to post daily pretties on Instagram so feel free to drop by and check that out (@thurston_post). I'd like to close by saying that I love our big, beefy Honda Pilot. Two weeks ago Hoss was rear-ended on his way to work. He was fine; there was a bit of damage to the back of the Pilot, but nothing major. He went out of town last week and so we haven't had a chance to take it in for repairs yet. Maybe that was a good thing since, as we were driving home from our little family picnic at the park on Labor Day, we were hit from behind AGAIN! And again, we were all fine and there was no significant damage to our car. The two cars that hit us took pretty good hits to their fronts; I have always loved the Pilot and I love it even more now for keeping us safe. On a side note, we had just transferred Nemy out of her infant seat and into Mr. Bagubian's old carseat. We bought him a new one and it was his very FIRST time riding in it! Now we have to get 2 new carseats. What a waste! But, I'm grateful we were all just fine. I'd rather experience a few fender benders than one major accident--especially with the kids. Be safe out there! This is a loving and beautiful remembrance for your mom-- I've been excited to see what you have been hinting at! My mom is the same-- always goes all out every season with the cutest, rustic tributes to the season. I have picked up the bug a bit-- I typically decorate a shelf in our entryway with seasonal fare. It's a nice tradition. Started making a wreath for the door this summer than can transition to a fall and winter one by switching out the flowers/adornments. I really want to make a banner though! 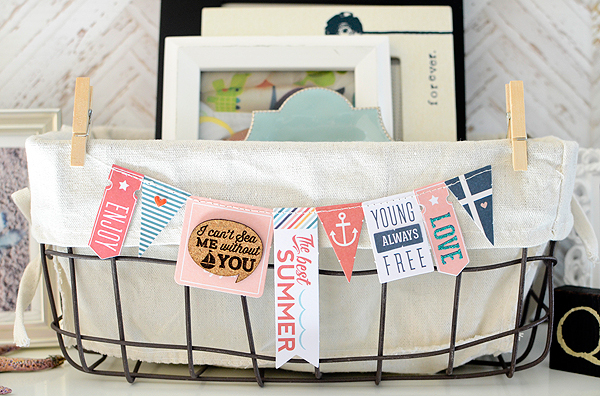 Love your little banner and the idea of a metal basket holding all the frames you can easily look through! Nice idea rather than putting holes in walls! Glad to hear you were all okay in the 2 incidents! What in the world. I'm going to finally get a post up, and it has your name written all over it! :) Talk soon! What wonderful projects! I love the basket and how you housed memories in it. 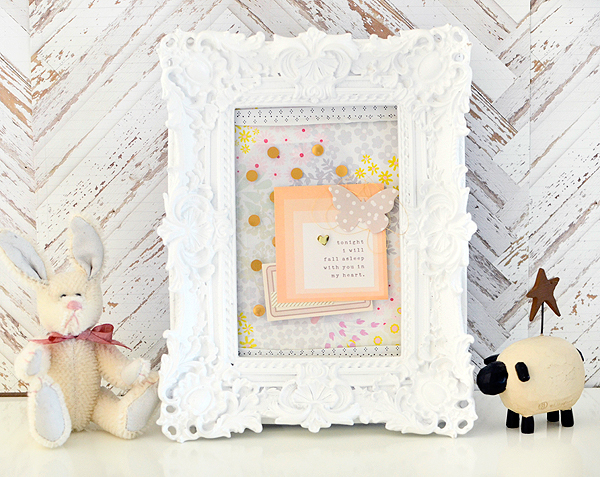 The banner is adorable....awesome idea with the frames...I'm a frame-a-holic and love that ornate white one....such sweet goodness you've framed it that one.